Assistant professor, Aurora Chang, will speak about undocumented students on April 4 at 7 p.m in Olin Hall, Room 101. One of the strategies that undocumented students have employed to “earn” citizenship is to academically achieve. 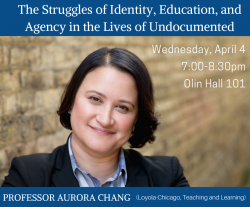 In this talk, Aurora Chang, assistant professor at Loyola University Chicago, shares the lessons she has learned on her journey/transition from a once-undocumented immigrant from Guatemala to a hyperdocumented academic in the United States. Through the telling of counter-stories from her own life and those of her students, she reveals how undocumented intelligence and hyperdocumentation, both terms she developed and theorized, are the foundation upon which undocumented students’ critical hope is built and their powerful narratives are told. This event is co-sponsored by the School of Education Diversity, Equity, and Inclusion Committee and Drake’s Center for the Humanities, Slay Fund for Social Justice and La Fuerza Latina.